Specialized in the manufacture of cosmetic, personal care and health packaging products, IMS Packaging has been enhancing its range of lipstick packs. Currently boasting an impressive 119 lipstick references in its catalog, the Chinese manufacturer highlights the benefits of its MA 148 option. GCC's TottleMania provides two solutions: doe-foot applicator & pipette tip. TottleMania offers a high level of accuracy in application. Its multi-function head allows you to play with the shape of the flock, the back of the applicator for the forehead, cheeks, and chin; the tip for spot application; or the surface for full face coverage. Shiseido, Givenchy, Godiva, Henkel and Unilever were among the many brands attending ADF&PCD Shanghai 2019. The highly anticipated 2nd edition, which took place at The Convention & Exhibition Center of International Sourcing on 27 & 28 March 2019, enjoyed a 26% growth in visitors. Qosmedix is excited to announce a new line of sleek, printed cylinder bottles for storing spa and cosmetic counter essentials. These 250 ml black bottles are labeled in white print to easily identify the product inside. The collection includes bottles with a spray top cap for: water, brush cleaner and alcohol, a bottle with a lotion pump for hand sanitizer and a bottle with a disc-top cap for makeup remover. Favini is pleased to announce that it is the winner of the prestigious award, LUXE PACK in Green, at LUXE PACK Shanghai 2019, the event dedicated to the latest global trends in the packaging sector. Celebrate 10 years of MakeUp in Paris this June! This is IT... Celebrate the 10th edition of MakeUp in Paris with us! The upcoming MakeUp in Paris edition, which will take place the 20-21 of June at the Carrousel du Louvre, promises to be this year again the UNIQUE rendez-vous dedicated to the European make-up and skincare industry! Continental Bottle is proud to announce this brand new innovative dual chamber bottle technology with the potential to add several bottles all in one. This new revolutionary way of combining a night/day fragrance or a perfume and cosmetic product all in one pack is a completely unique way of dispensing your precious formulations. This PP cosmetic pen can be used in a variety of ways for a range of differing cosmetic products. It is ideal as a cosmetic twist pen, cuticle oil pen, teeth whitening pen or a lip gloss pen. The Toly Group has been operating in Malta since 1971. From humble beginnings, the group today is led from its Maltese headquarters and has exceeded global sales of €100 million. The world of cosmetics is tackling sustainability and environmental issues head on. This includes each and every step along the way of creating the most effective products for its final conscientious consumers. KBL offers a number of sustainable packaging options for skin care, cosmetics and make-up products. COPCO introduces a mist sprayer with nozzle for directing product to a targeted area. The nozzle offers a differentiating look to the mist sprayer and offers a convenient and practical solution for scalp spray and hair products targeted to the roots, as well as pet care products. 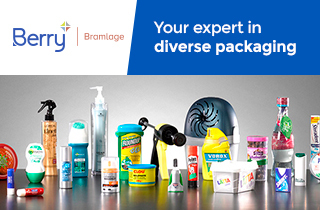 A strikingly-decorated Twist Up airless dispenser from the RPC Bramlage Division is creating the appropriate on-shelf image and impact for one of Italy’s top-selling and long-established personal care brands. Bionike’s Defence Man Energise revitalising cream-gel and Defence Man Repower anti- ageing serum are being packed in the 50ml Twist Up.